Sri Lankan government ends emergency, but police state continues..
More than two years after the defeat of the Liberation Tigers of Tamil Eelam (LTTE), the Sri Lankan government has finally lifted the state of emergency imposed during the war. President Mahinda Rajapakse announced the move last Thursday in a bid to deflect mounting international pressure over his government’s war crimes and abuses. The decision was immediately hailed by the media and political establishment in Colombo as a step toward democracy. In reality, the change is purely cosmetic. 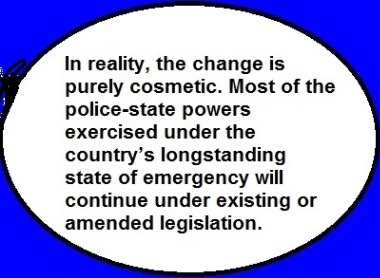 Most of the police-state powers exercised under the country’s longstanding state of emergency will continue under existing or am ended legislation. These anti-democratic measures will be enforced as newly proclaimed regulations under the draconian Prevention of Terrorism Act (PTA), which remains in place. The PTA gives sweeping powers to the security forces and police, including detention without trial for up to 18 months. Peiris also explained that the government intended to pass an “Emergency Sequential Bill” to make unspecified emergency powers permanent. The new regulations and proposed law are yet to be made public, further underlining the anti-democratic character of this government. Amid rising class tensions in Sri Lanka, the government will certainly find an alternative way to impose bans on strikes and industrial action. Just weeks after breaking the 2002 ceasefire with the LTTE and plunging the island back into civil war in July 2006, President Rajapakse invoked his emergency powers to declare the Central Bank, fuel supplies, postal and telecommunication services, export industries and public transport as “essential services,” effectively banning industrial actions. The government mobilised the military on a number of occasions to break strikes, including in hospitals. Despite the defeat of the LTTE in May 2009, Rajapakse imposed an essential services order in November 2009 to outlaw a limited work-to-rule campaign by workers in the Ceylon Petroleum Corporation, Ceylon Electricity Board, the Water Board and the ports. The government did not need to impose censorship as it terrorised the media through other methods. Following Rajapakse’s installation as president in late 2005, hundreds of people—Tamils, politicians and government critics—were abducted and in many cases murdered by pro-government death squads operating in collusion with the military. Journalists and media workers were prime targets, forcing numbers to flee the country. No one has been detained, let alone charged and convicted, in any of these cases. The lifting of the state of emergency will do nothing to prevent pro-government thugs from continuing such attacks. Throughout the course of his rule, Rajapakse has demonstrated nothing but contempt for the legal system, the country’s constitution and parliament. Having gained an overwhelming parliamentary majority at the last general election—largely as a result of the political bankruptcy of the opposition parties—Rajapakse changed the constitution to widen his powers, including to appear in parliament whenever he decides—as he did last week. The state of emergency has been in place almost continuously since 1979 as the then United National Party government plunged the island toward a full-blown civil war, which then erupted following murderous anti-Tamil pogroms in 1983. The emergency was lifted after the ceasefire was signed in 2002, but was re-imposed after the still unexplained murder of Foreign Minister Lakshman Kadirgamar in August 2005. Rajapakse, who won the November 2005 election, maintained the state of emergency as he sabotaged peace talks and prepared for renewed war. Rajapakse’s “democratic” gesture of lifting the emergency last week was primarily aimed at defusing international criticism—particularly by the US, India and the European powers—of his government’s human rights record. All these countries backed Rajapakse’s war and turned a blind eye to the military’s war crimes and abuses until the final months of the conflict. Concerned at the growing influence of China in Colombo, they have since exploited the issue to pressure Rajapakse to distance himself from Beijing. The panel report estimated that tens of thousands of Tamil civilians were killed in the final months of the war alone. The relentless shelling of civilians in LTTE-held areas also involved the deliberate bombardment of hospitals and aid centres. After the LTTE’s military collapse, the military herded some 280,000 Tamil civilians—men, women and children—into detention centres or “welfare villages” where they were effectively imprisoned without charge. Only after thousands of “LTTE suspects” were dragged off to unknown prisons did the army begin to “resettle” the detainees. Rajapakse is desperate to avoid a discussion at the UN human rights body on the panel report, which the government has dismissed out of hand without providing any evidence to refute the allegations. The US State Department has indicated that it will call for Sri Lankan human rights violations to be listed for discussion in sessions to be held next March. But instead of the UN panel report, Washington has suggested an “interactive dialogue” on the report of the Colombo government’s bogus Lessons Learnt and Reconciliation Commission (LLRC), set up to whitewash its war crimes. This manoeuvre is aimed at keeping the pressure on Rajapakse, while at the same time offering a possible solution—as long as he begins to toe the US line. The Sri Lankan government is taking steps to line up support to block any debate in the UN committee. The Sunday Times reported that the Sri Lankan ambassador to Geneva has been instructed to “get in touch with the Latin American group of countries.” External Affairs Minister G.L. Peiris began a two-week tour on Sunday to lobby leaders in Singapore, Jordan, South Korea and others in the Non-Aligned Movement. The US and India have already issued statements welcoming Rajapakse’s decision to lift the state of emergency. They have been joined in Colombo by the main opposition parties—the United National Party (UNP) and Janatha Vimukthi Peramuna (JVP)—which supported Rajapakse’s war, routinely voted for the monthly renewal of the state of emergency and only belatedly began to call for its withdrawal. This chorus of support for Rajapakse’s announcement simply underlines the cynical manner in which the issue is being exploited both internationally and in Sri Lanka for political purposes. The US and its allies will ignore the Sri Lankan government’s anti-democratic methods as long as it aligns itself with Washington. The UNP used the opportunity to offer its support to the government to counter “international pressure.” And the JVP leaders, who vociferously defended all of the military’s war crimes, are now posturing as “democrats” by calling for the repeal of the PTA as well. Far from being dismantled, the machinery of a police state built up over a quarter century of civil war is being maintained and will inevitably be turned on the working class as it comes forward to defend its basic rights and living standards.